By HighDesert Software. 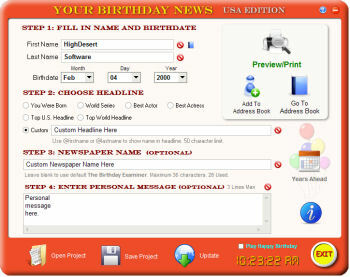 Create and print an attractive, personalized newspaper that reveals interesting information about the year you were born, or any date between January 1st 1900 and December 31st 2011. Free lifetime upgrades. By HighDesert Software. Create and print an attractive, personalized newspaper that reveals interesting information about the year you were born, or any date between January 1st 1900 and December 31st 2011. Free lifetime upgrades. - Easy to use interface. - Create as many newspapers as you want. - Choose any date from 1900 to 2011. - Preview before you print. - Choose from 6 different pre-made headlines or create custom. - Add a multiple line personal message to bottom of page. - Now includes Years Ahead, allowing you to send someone a different news page each year, depicting events that occured at a given age. - Easily select a recipient using the Address Lister. - Send news page by email. - Create a custom newspaper name, or use default. - Store birthday info in Address Book. Holds unlimited names, addresses, birthdates, notes, etc. - Birthday Tracker tracks any birthdays in the Address Book. - Auto Address Book database backup. - Search Address Book for First Name, Last Name, Day, Month, Year or Notes. - Print address list. - Save newspaper to rtf format for viewing and editing in Microsoft Word. - Open saved newspapers for printing. - Activity log. - Perfect for family, friends, employees birthdays, scrapbooks, etc. - Something they will treasure for years. - No special paper required. - Free upgrades for life. WinCup managed Sport-Leagues e.g. Soccer, Foot- Hand- Volley-ball, Chess, Tennis, Dart, automaticly Gameprogram generating, 2-24 -uneven- Clubs, 3/5-set-League, TOTO-Tip, Total- Home- Outward-Wide-Tables, all Results from 1.Bundesliga since 1963. Tennis Board allows you to umpire or to analyze tennis matches in an easy way. From score keeping to strokes analysis, simply press application buttons with your fingers to chart players while keeping your eyes on the game. When Cholera takes the parents of Mary Lennox, she is shipped from India to England to live with her Uncle Craven. Archibald Craven's house is dark, drafty, with over 100 rooms built on the edge of the moors. Weather Monitor software for use with RadioShack WX-200 and Oregon Scientific WM918 / WMR968 Weather Stations. Supports client/server operation -- share weather across your LAN. Uses ActiveX gauges for user-friendly appearance. This site does not contain serial number, crack, keygen Your Birthday News serial number : serial number is the simplest type of crack. A serial number(cdkey,product key,etc) is register the program as you may already know. a crack or keygen may contain harmful software. If you cannot find the exact version you want, just give it a try. for more information read .nfo/.txt/.diz file include in zipped file.